Suspect In Istanbul Nightclub Attack Has Confessed, Say Turkish Officials : The Two-Way The suspect was identified as a citizen of Uzbekistan born in 1983. Istanbul's governor says Abdulgadir Masharipov was trained in Afghanistan and appeared to have entered Turkey illegally. 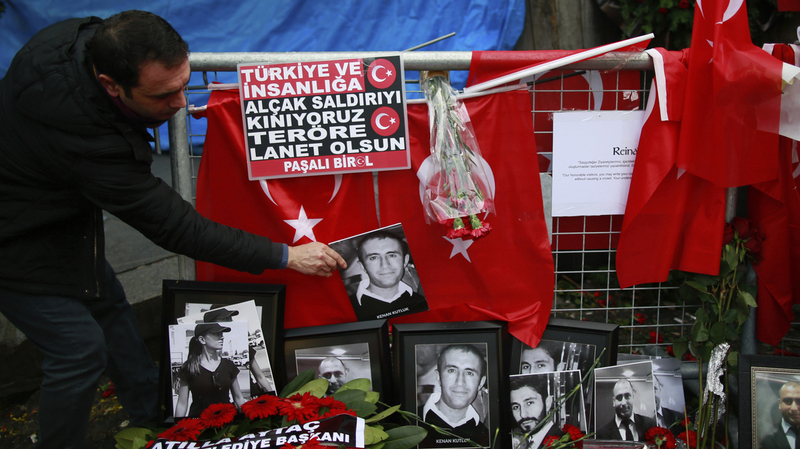 A man adjusts a victim's photograph displayed with floral tributes and Turkish flags outside the Reina nightclub following the attack in Istanbul earlier this month. Istanbul Governor Vasip Sahin told reporters Tuesday morning that the suspect in the attack on the city's Reina nightclub has confessed. Sahin identified the suspect as Abdulgadir Masharipov, born in 1983, a national of the Central Asian country of Uzbekistan. "The terrorist has admitted to his crime, and his fingerprints also matched those found on the scene," Sahin said. 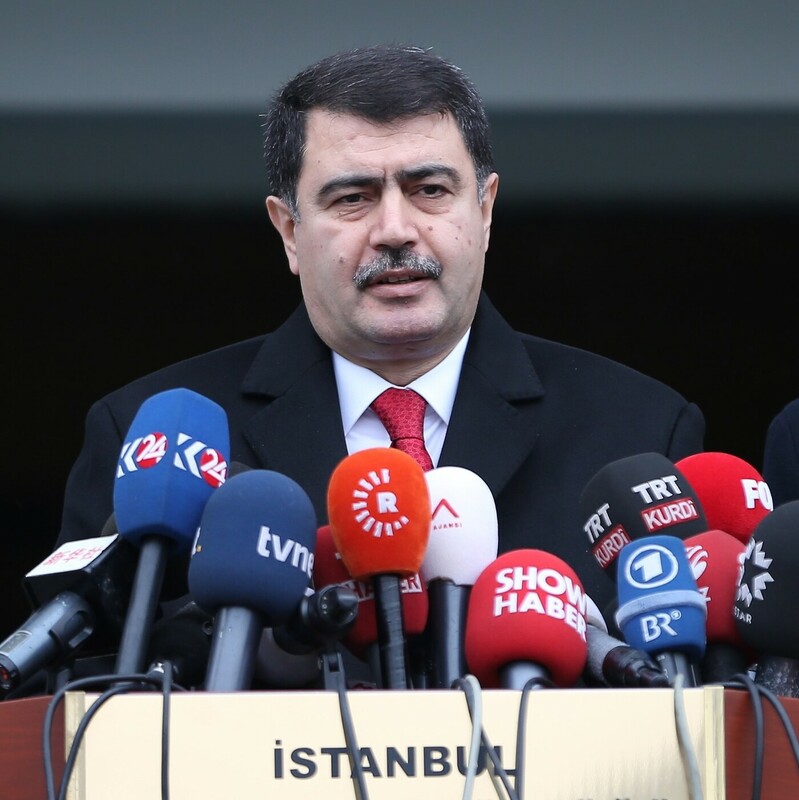 Governor of Istanbul Vasip Sahin at a press conference on the capture of Abdulgadir Masharipov, the main suspect behind the deadly attack on an Istanbul nightclub early on New Year's Day. Sahin said there are strong indications Masharipov was acting on behalf of the Islamic State and had entered Turkey illegally on its eastern border. "He's received training in Afghanistan and speaks four languages," said Sahin, "a terrorist that has been well brought up." The governor described an exhaustive manhunt involving the viewing of some 7,200 hours of video footage and the use of 2,000 police officers supported by Turkish intelligence. The search extended to central Anatolia and the Aegean coast. Sahin said 150 raids led to the detention of 50 people, two of whom were arrested and will face charges. There was speculation Marashipov had fled the country, perhaps to Syria. But ultimately he was arrested in an Istanbul suburb Monday night. Four others were taken into custody with him. The attack occurred early New Year's Day in an upscale nightclub overlooking the Bosporus Strait. A gunman, apparently acting alone, killed 39 people and wounded dozens more. Most of the dead were foreigners. A photograph of Masharipov released by the government after his arrest shows him with an apparently bruised and bloodied face. Officials say Marashipov is being questioned in particular about possible accomplices, as well as any other attacks that may be planned in Turkey.